For those of you that don't know, I'm a crafter. 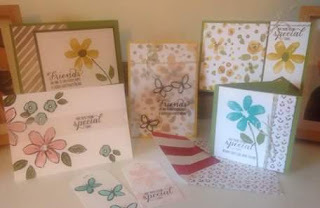 My hobby is making things, mostly paper craft, but I have been known to their in some knitting, crochet, cross-stitch, and candle making, among others. 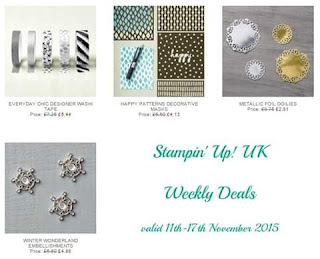 As well as a fabulous range of quality paper crafting products, including stamps, ink, cardstock and adhesives, there are also weekly deals (current deals shown below), available while stock lasts. Why not click on the link to the right to see the full range, or to find out more about the Stampin' Up! opportunity.